A joint project of Kalunba Social Services Ltd. and the Department of Translation and Interpreting of Eötvös Loránd University, the Interpretation Course financed by the European Asylum Migration and Integration Fund, has graduated the first class of fifteen students, among which are former beneficiaries of Kalunba. 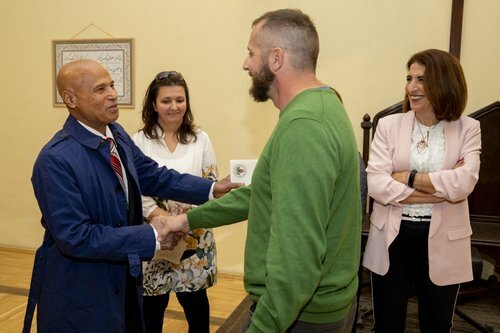 The project included training native speakers of Arabic, Somali, Urdu, and Persian in interpreting to and from Hungarian. Through classroom studies, field practices, and international study tours, the course facilitated interpretation techniques, improved communication skills, increased language proficiency, as well as taught background in legal processes, psychology, and interpersonal and intercultural interactions. Graduates are now certified to assist Hungarian authorities. The ceremony was held on Saturday, 29 September at St. Columba’s Church of Scotland in Budapest. Kalunba Social Services Ltd. serves as the implementing partner of the RCH Diaconal Office, taking a comprehensive approach to integration work among refugees. The goal is to empower clients, helping them to become independent. In addition, internationally renowned Syrian guitarist, Ayman Jarjour performed a charity concert held before graduation ceremony. 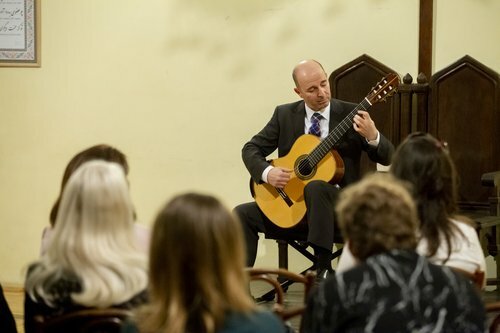 He performed a wide range of classical guitar repertoire, including traditional Spanish and Latin American, Baroque, Classical, and contemporary music. Since his debut, Jarjour has performed all over the world, specifically in the Middle East, Europe, the United States, Africa, and the Far East. Born in Damascus, Syria, Ayman Jarjour is actively involved in many charities working with refugees in and outside of Syria and with those affected by the war. Learning of the ministry towards refugees and migrants, Jarjour proposed for all donations from the concert to support the ministry of Kalunba Social Services Ltd.
Jarhour’s other international performances include concerts in New York, London, Edinburgh, Brussels, Beirut, Amman, Madrid, Bonn, Tunis, Khartoum, Valletta, Cairo, Alexandria, Istanbul, Basel and Taipei, the last attended by the Taiwanese President. He has appeared on many TV channels in concert broadcasts and interviews. In New York, he gave a concert to a standing ovation at Carnegie Hall’s Weill Recital Hall as winner of Artists International’s Special Presentation Award.